Purchase to earn 33 Points! These beautiful Intuitive Aragonite Turtles are from my good friend in Morocco and they remind me of the age-old phrase: Slow and steady wins the race! Each of these turtles is carved from a unique combination of different gemstones, adding special magic to their symbolism of strength, wisdom, and grounding. Featuring aragonite, onyx, jasper, agate, and more, each intuitive aragonite turtle brings a message just for you. 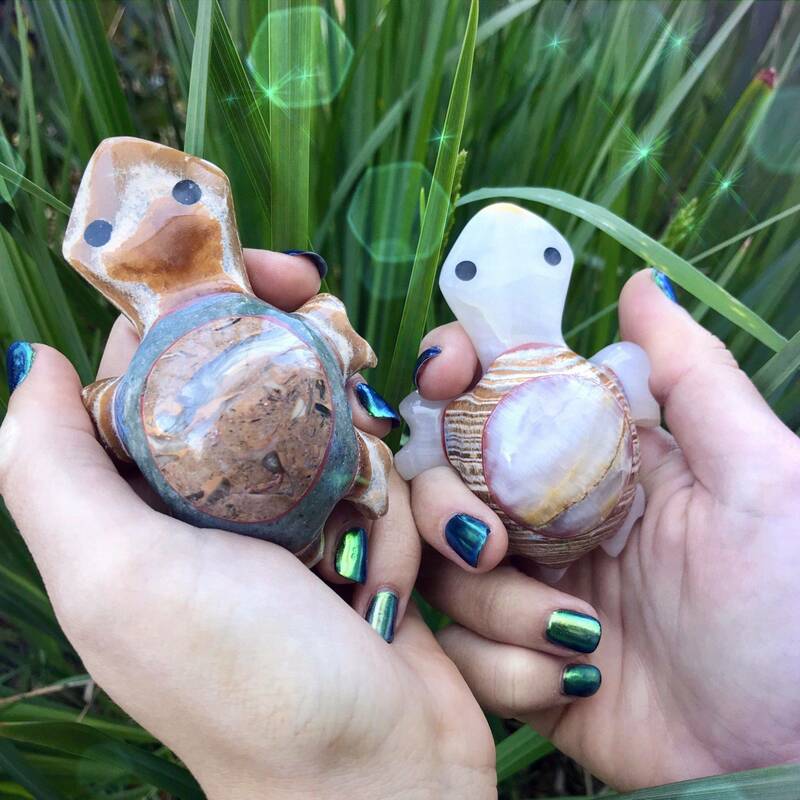 Whether the turtle is your spirit animal or you’re simply in need of more patience and strength, these stones were handcrafted with you in mind. Allow us to intuitively choose the turtle that desires to wade in your direction. 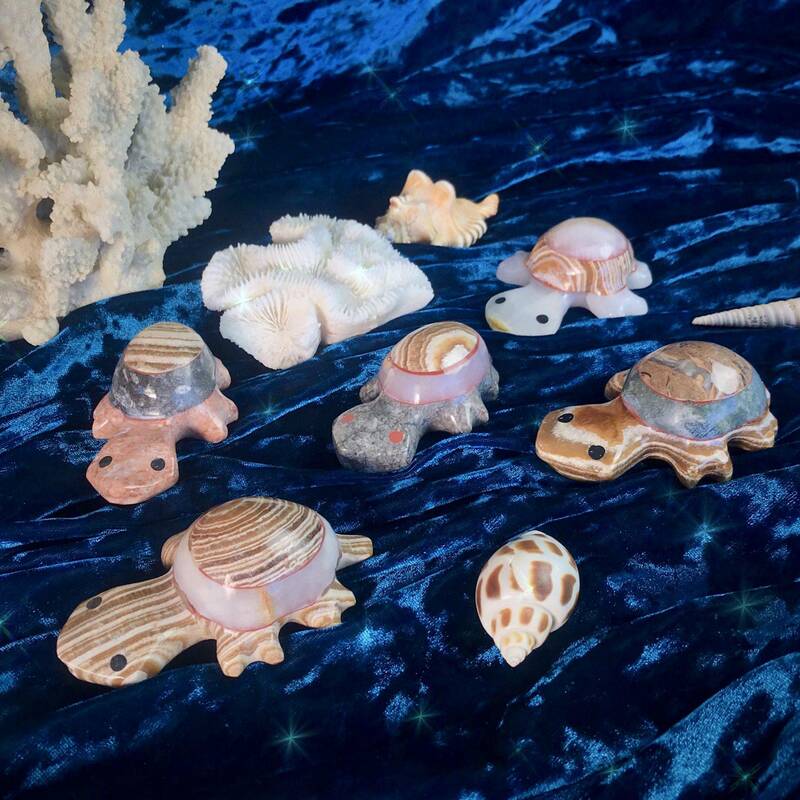 Trust that the Intuitive Aragonite Turtle meant for you will find its way to your home! It may surprise you, but turtles are actually connected to the element of Earth. They hold incredible ancient wisdom as they have the ability to absorb and the patience to understand. Sturdy and slow-paced on land with free-flowing agility in water, they represent peace, appreciation, and the fluid nature of emotions. When carved from aragonite, these pieces are a gemstone-animal correspondence of great potency. Aragonite raises the overall vibration of the body in order to become a more attuned receiver to spiritual energy. It also helps you release lingering emotional wounds, so that you may access aspects of your soul history and explore vital information for your path. Aragonite, which comes in pink, brown, and red, is especially helpful for energy workers because of its ability to bring awareness to any imbalances in a person’s energy. This stone is an especially powerful tool for crystal healers, especially in doing any crystal bodywork. 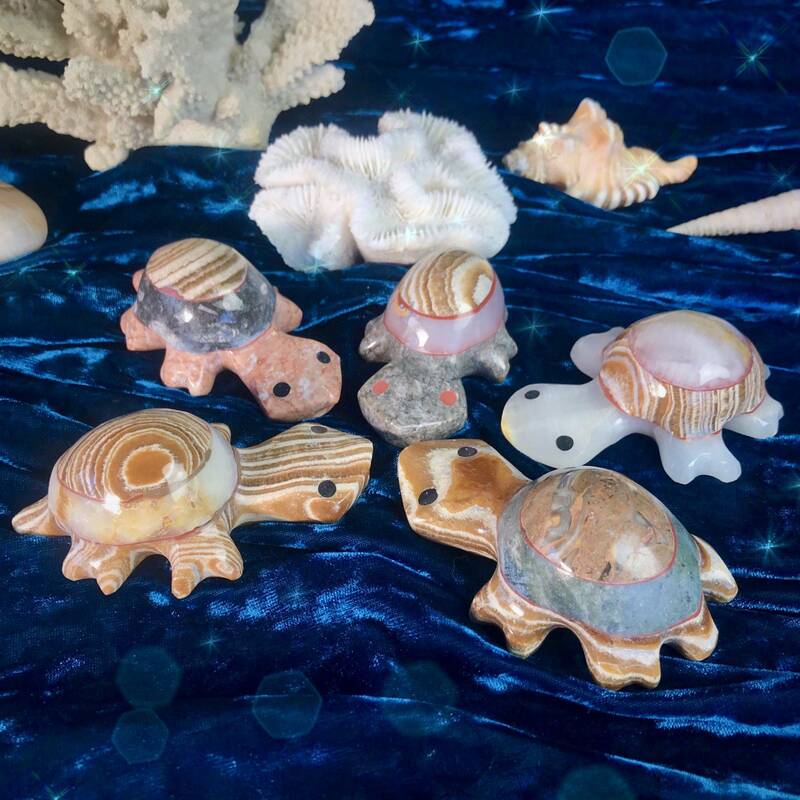 Place one of these Intuitive Aragonite Turtles on your altar or in any area of your creative or sacred space to channel the ancient wisdom of this beloved animal totem. Allow its energy to radiate all throughout your environment, bringing healing magic, patience, and flow. This listing is for one (1) Intuitive Aragonite Turtle (about 3-4” in size). Yours will arrive lovingly parceled along with a single leaf of white sage and a card describing the properties of the stone.